This post is brought to you by the Happy Family brand, Love My Veggies. I, myself, don't always have the healthiest track record when it comes to eating my veggies and even at thirty-one years old, I struggle with fulfilling my daily requirements. My kids, however, are none the wiser and it's my job, quite literally, to set them up with a healthy foundation and love of all foods at such a young age, including meeting their daily requirements of a rainbow full of vegetables. While I take pride in knowing how to feed my family healthy, home-cooked meals, it takes a village and Happy Family® is undoubtedly a part of my village. Whether we're at home and the boys are raiding the pantry for yet another snack to fill their bottomless bellies or we're on the go and it's nearing the baby's meal time, Happy Family® pouches provide quick and delicious premium organic, nutrition that's ideal for their growth and development. This month, Happy Family® will unveil a brand new line of pouches, Love My Veggies, the very first line of pouches to include a FULL serving of delicious, nutritious vegetables. 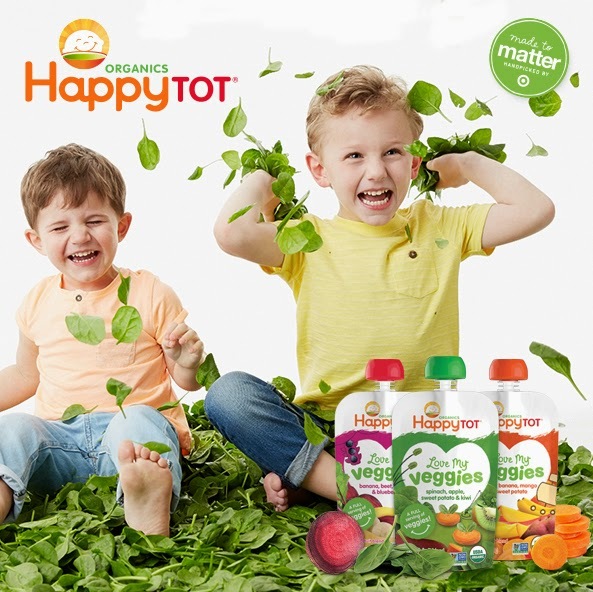 Vegetables like sweet potato, beets, squash and spinach mix together with favorite fruits such as kiwi, apple and blueberry in blends that will undoubtedly make your little one say "YUM!" In addition, these pouches pack an even healthier punch as they're filled with essential vitamins A, C, iron and magnesium tailored to your growing baby's needs. To learn more about this brand new line of pouches, see even more pictures from our amazing adventure in NYC and enter to win your OWN Snack Happy Gift set from Happy Family, head here! All images c/o Tara Donne. Thank you, Happy Family, for sponsoring today's post.